In three decades of coaching high school football teams, I amassed a fairly big cache of memories both pleasant and unpleasant while with my teams. 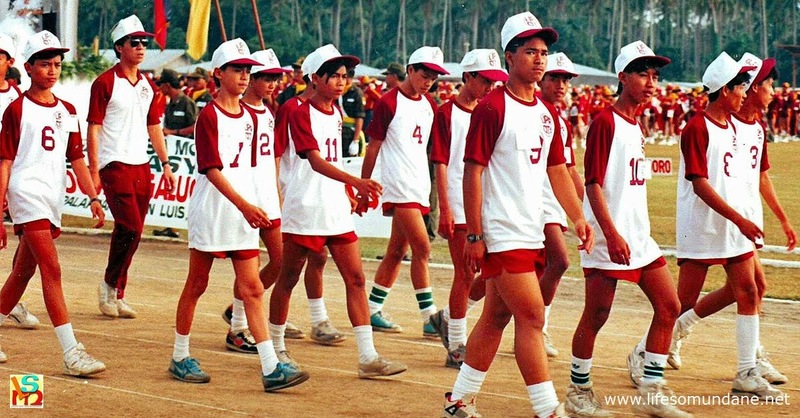 Some of the most bizarre occurred in this annual meet called the Southern Tagalog Regional Athletic Association or what everyone simply referred to as the STRAA. My first experience of this regional event was early in 1983. The STRAA was to be hosted by the city of Lucena in Quezon. All athletes and coaches from DLSL were told that assembly would be at the DLSL lobby and that the local Division Office would send a bus to fetch us. The bus arrived more than an hour late; and when it did, it was already filled with Division Office personnel who were tagging along as part of the delegation. When I say filled, there were already people standing along the aisle of the bus. Naturally, we did not board. How obvious could things be? So somebody came up with the brilliant idea that we should all make the short trip in jeepneys to the Division Office so that transportation arrangements could be made. Not that we had any problems with the kitchen staff, who were always kind and gracious to us. I made sure that my boys stayed in favour. We always ate together, were polite to the kitchen staff and had players assigned to clean up the food trays afterwards and have these returned in neat piles. For our efforts, we were always rewarded with good servings. Once there, we heard officials making arrangements to ferry the athletes in a dump truck to Lucena. Duh! I was already half-thinking of sending my boys home when reason finally prevailed and the officials were asked to disembark from the bus. We took their places and I do not recall how they travelled to Lucena. Maybe in the dump truck. I do not recall what year it was because I attended so many STRAAs over the years; but there was this one time when we were told to wake up at 5:00 in the morning so we could practice… marching for the parade. First of all, what was it with the Division Office people that they never came around to the fact that athletes needed their sleep, especially those of endurance sports like football? To get up early was bad enough; to get up early to practice marching was the sort of thing that would elicit nothing but disdain. Nonetheless, everyone marched half-heartedly; and if only those in charge could hear the scornful remarks all around. Because there was no snare drum, one of the kitchen staff was asked to pound on the cover of a large cooking pot with his ladle. Classic! There was this year when, for the first time, athletes and coaches were being issued track suits, sneakers and bags. The STRAA opening day parade was also, in a way, a friendly competition among delegations. The divisions showed off to others what they gave their respective delegations. I did not mind being asked to wear the track suits – but marching with the bags slung across our shoulders like we were elementary kids going to school? I never felt more stupid in my life! Anyone who has been to the STRAA will remember the ‘midnight snack’ which was actually served just before lights out at 10 o’clock. Most nights, this was the deadly combination of mugs of Milo and hard-boiled eggs. I say ‘deadly’ because there could be farting wars inside quarters later on once lights were turned off. Farting was the least of our problems whenever we prepared to go the STRAA, however. In latter years, most public schools – which were used as delegation quarters – already had toilets inside each room. In the earlier years, this was not always the case. In fact, my first STRAA in Lucena was memorable for the utter lack of toilet facilities. Number 1 was no problem at all for us males; as obviously we could always find a tree to relieve ourselves onto. Number 2 always was the problem. That year, the toilet was a hole dug in the ground which was surrounded for modesty reasons by this thatched material called ‘sawalî.’ Good Lord, but who among us could do it squatting, pray tell? That is, if anyone was courageous enough to go inside the makeshift toilet. The stench was strong enough to kill the entire delegation! That was why, in the succeeding STRAAs, the first order of business for my boys and I was to scout the host city or municipality for motels where we could check in ‘short time’ to do our toilet. But naturally, most of these establishments were haunts of the sweet painted ladies. In Sta. Cruz one time, aboard a tricycle to go to this motel, when we told the driver where we were headed he maliciously remarked that we were too early. To go whoring, was what he was insinuating. Our preference always was that our next-door neighbours at the delegation quarters would also be teams from DLSL. We all knew how to take care of ourselves and were sensitive to whoever was next door. Regrettably, we had little choice in the matter. There was this baseball team from another school, for instance, who in the 1992 STRAA in Puerto Princesa was assigned the room next to ours. This was to our utter misfortune because they talked and laughed till the wee hours of the morning and were up earlier than the roosters. Naturally, they lost their first two matches and were eliminated from the competition in the bizarre double elimination format that they so loved to use in the STRAA in those days. Unfortunately, we did so too; and they were as much to blame as the midday heat and humidity in Puerto Princesa. Those in the grandstands were saying that my team was quite good but just did not move enough. How could they when they slept as little as the idiot baseball team next door? It was a good thing that I had a cousin in the city. When we were eliminated early, we went sightseeing. But of course! Speaking of being eliminated, particularly in the earlier years, one dreaded being eliminated early. Although the delegation officials were decent enough not to say it out loud, but there was talk among athletes about being regarded as pigs for fattening if a team was eliminated. What that meant was that the team was being fed although it no longer had a chance of winning honours for the city. I was particularly sensitive to this. If the STRAA was being held somewhere near and we were eliminated, Mang Erning was always a phone call away. He was the driver who took us to our RIFA matches and would always willingly fetch us from delegation quarters if we had no more matches to play. I thought it was better this way. Whatever food allotments were due to my players could be given, instead, to athletes who were still in contention. There are many more stories to tell; but they will have to wait for another article. This was already quite a journey down memory lane as it was. I was never particularly fond of participating in the STRAA; but I guess even the bizarre experiences were better than not having gone at all.